Microsoft Dynamics GP (formerly Microsoft Great Plains) is a feature-rich business management system that has been implemented by nearly 50,000 companies. For both small and midmarket companies, GP offers an affordable and scalable ERP software solution. With over 25 years of functionality built-in, Dynamics GP can meet the requirements for multiple industries such as Wholesale Distribution, Discrete Manufacturing, Hospitality, Professional Services and more. Conveniently manage your company’s cash flow, improve collections, and control fixed assets. Automate your payables and receivables while streamlining expense management. Have the ability to work with multiple currencies, locations, and companies. If you're using basic accounting software, this will be a noticeable upgrade. Keep your customers happy by keeping on top of demand, reducing lead times, and fulfilling orders fast. Improve your inventory management and ensure all quantities are precise and available when you need them. Enhance your purchasing and sales order processing, keeping vendors and suppliers in check. Accurately track production costs and manage work orders more effectively. Collect, organize, and review changes to your orders before the go into production. Manage all your materials planning, components, and product assemblies. All the pieces of your hiring, training, and compensation puzzle in one place. Fully manage your payroll in-house or share your data with an outside provider. Implement and track benefit programs and allow your employees to view their personal data safely and securely. Maintain control over your company’s project costs, direction, budget, and billing. Capture, review, and approve project time and expense data. Easily create up-to-the-minute reports and manage your budgets. Executives can be notified of key business metrics in real-time to support decision making. With over 225 customizable reports, you will have a complete 360-degree view of your business. To discover the full capabilities of Dynamics GP, please check out this helpful guide. Plus there are hundreds of available software add-ons, which can further enhance GP to cater to your industry and processes. Dynamics GP is more accessible than ever and has multiple deployment options. Whether you choose to host your ERP system on-premises or in the Cloud, purchase the software or pay a monthly subscription, we can guide you and help carve your path to implementing your business system.  Since 1989, we've guided customers through the process of successfully implementing ERP software. Contact us if you need help choosing or implementing your business system. "We chose Dynamics GP because it offered all the functionality we wanted, easy integration into our existing infrastructure, and extendibility so we knew we wouldn’t outgrow it. Because it looks like other Microsoft Office programs employees are already familiar with, training was simple."